Paul Barford, a professor at the University of Wisconsin, led an effort to map the major routes used by the Internet in the U.S. He believes that making knowledge of the map can help us plan better to make the Internet less susceptible to natural disasters, accidents, or intentional sabotage. I can remember two times when the Internet backbone took a serious hit in this country and they were both in 2001. First, a 60-car CSX train derailed in the Howard Street tunnel in Baltimore, the resulting fire melted a lot of fiber cables that were on the east coast north-south route. Then later that year on 9/11, the twin World Trade Towers collapsed taking out the main carriers’ hotel and data center in Manhattan. And there is no reason to think that we won’t have more disasters. When you look at the map, my first reaction is how few routes there are in the main backbone. Professor Barford hopes the map will spur conversation about the need for more route diversity. The Department of Homeland Security agrees and is publishing the map and making the details of the routes available to government, public, and private researchers. Some might say that publishing such a map makes us more vulnerable. I don’t think it does. Everybody in the industry knows the addresses of the main Internet POPs since those are the end points of the data connections that ISPs buy to connect to the Internet. 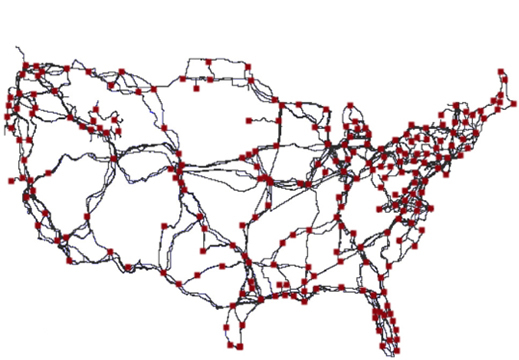 And I didn’t really need this map to know that the major routes of fiber mostly follow the Interstate highways. In Florida, where I live, there is a route on I-95 on one side of the state and I-75 on the other with a spur to Orlando. I doubt that anybody here in the industry didn’t already know that. The one thing that strikes me about the map is that once you get off the major big city routes that many of the smaller US markets only have one route into and out of their hub; it doesn’t look that hard to isolate some markets with a couple of fiber cuts. I know that some of the carriers involved in the backbone have contingency plans that don’t show up on this map, and there are other fiber routes that can pick up the slack fairly soon after a major Internet outage in most places. The other thing you realize about this network is that it wasn’t really designed—it grew organically. The network takes the shortest path between major markets using major roads and thus follows the routes built by the first fiber pioneers in the 80s and early 90s. Hopefully this map spurs the carriers to get together and plan a more robust backbone going into the future. It’s very easy to get complacent about a network that is functioning, but this map highlights a number of vulnerable points in the network that could be improved. This kind of planning was undertaken by the large electric grids after a number of power outages a decade ago. Let’s not wait for major Internet outages to get us to pay attention to making the network safer and more redundant.